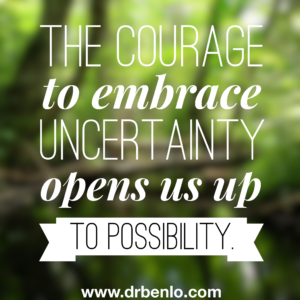 I was just listening to an interview of Iyanla Vanzant by Jerry Clark while dropping our son at basketball practice, and had the impulse to write a post on the Power of Uncertainty. Iyanla and Jerry were talking about how we’re all control freaks – we like to know how everything’s going to turn out before we do anything — and I realized that if we hold to this desire for control too tightly, we’ll never allow ourselves to create or experience anything new. How’s this apply to business and life? Imagine I had demanded that I knew how things would turn out with Rachelle before I dated her – we never would have been here today with 7 kids and 23 years of marriage, challenges, and rewarding adventures! Or in business – if I had demanded that I knew whether a customer or potential business partner was going to say “yes” before I spoke with them – I never would have allowed the amazing relationships, discoveries, skill development, and business results that have unfolded in our lives. And we’re still discovering and experiencing new things – in fact, that’s what makes life interesting. 1. Courage to embrace – regardless of your belief in a Higher Power or the Universe being for you, having the courage to embrace the uncertainty and adventure of life makes things a lot more interesting. Iyanla spoke with Jerry about the difference between “choice” and “decision” – decision weighs facts and figures and is based on what you can see and know. Choice opens the door to possibility, even though you may not know what all those possibilities are or don’t know how everything’s going to turn out. 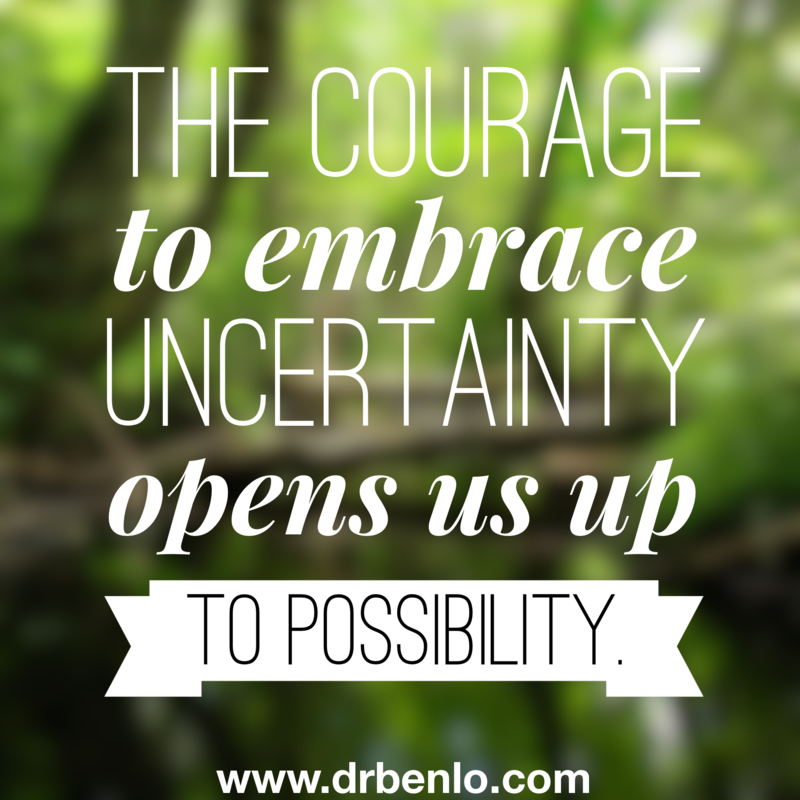 Choosing to embrace the uncertainty, challenges, and possibilities of life is one of those choices, and is a powerful strategy for allowing more into your life. 2. Trust – for those of us who do believe in God, a Higher Power, or even simply that the Universe is working for our good – trusting this power and process even though we can’t always see how things will work out ourselves is a key process that can open us to the uncertainty – and the possibilities – of life that we otherwise may shy away from, and allows us to go forward without fear. 3. Others’ stories – the third factor I’ve found richly empowering that essentially makes it easier to practice #1 and #2 above is to listen to, read, and continually enjoy the stories of others who’ve experienced the richness and worthwhileness of embracing uncertainty and stepping into possibility in their own lives. In essence, you can build up an “internal library” of these stories that becomes a well from which to draw as you navigate your own moments of challenge, uncertainty, and new doors of possibility opening before you. Now think back on your own life for a moment. What’s one of the most rewarding experiences you’ve had? I bet at some point along the way, there was a door of possibility you were willing to walk through, without fully knowing or being “in control” of what was on the other side. Have one of these examples you’re willing to share? We’d love to hear from you in the comments below! May we all continue to have the courage and trust to embrace the uncertainties — and the possibilities — before us in the years ahead. Here’s to creating a life you love! P.S. Want daily tips to energize and equip you in business and in life? Catch live “Quantum Moments” with me on my Facebook page Mon – Saturday mornings at 9am Eastern time. See you there! What’s On Your “Intention List” Today? 1) What’s on your “intention list” today? By “intention list”, I’m actually referring to something different from your “to do list”. Your “to do list” may include all kinds of tasks, major and minor, that you have on your list to get done, but your “intention list” refers to the “big things”, the most important things that you want to sow in your business, your health, your relationships, your life today to have a fulfilling day and move your life forward. Perhaps it’s a blog post or video you want to create, 3 new connections or appointments you want to set, or a key meeting or presentation you have today. On a personal note, it may be a walk or connection time with a loved one — your spouse, partner, son, or daughter; dinner together as a family; or reading to your kids before bed. What are the few “big things” that you really want to sow today to create a fulfilling day? Put these on your “intention list” — and ideally set a time or at least a segment of your day when you plan to carry out each intention. You can always adjust as you go through your day, but it will make a big difference to be clear on your intentions and have an initial plan for when you’ll accomplish them. 2) What would be “enough”? See yourself at the end of today — looking back on today, what key actions, accomplishments, or experiences — what key sowing — would actually be “enough” and feel good when you reach the end of your day? This is key from two perspectives: first, it helps you clarify what really is important to you today and second, it helps you decide ahead of time what would be “enough” so you can actually feel good as you navigate your day and particularly when you wrap up your day tonight. Otherwise we have a tendency to just keep going from task to taskt to task, always having more to do, and never feeling at peace. 2) What would be “enough” so you could feel happy and fulfilled at the end of your day? Feel free to share one or more of your answers in the comments below, and here’s to creating today as the next step in creating a life you love! Author Dr. BenPosted on May 24, 2016 May 26, 2016 Categories Personal Transformation, Success Strategies, VideosTags creating a life you love, Dr. Ben Video Tip, enough, intention list, personal growth and development, success strategiesLeave a comment on What’s On Your “Intention List” Today?